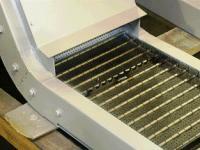 Storch Steel Hinge Belt Conveyors are versatile for cold heading, dies, machining, presses and parts handling operations. Ideal for many installations: single station, central collection and in-floor systems.Storch Steel Hinge Belt Conveyors are designed with either 1-1/2″ or 2-1/2″ pitch. The pitch is determined by the type of material to be conveyed and the size restraints of the application. Storch Steel Hinge Belt Conveyors are designed in-house to exceed the specifications of OEM supplied conveyors. From Heavy Duty replaceable tracking to oversized rollers on the belt; Storch has put together a winning combination that is dependable and price competitive. 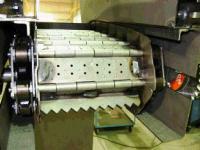 Typical for small to medium parts, fasteners & scrap handling, and light to medium chip handling. Low profile applications can easily be accomplished on our 1-1/2″ pitch steel hinge belt conveyor with a standard low-profile 5″ tall frame. 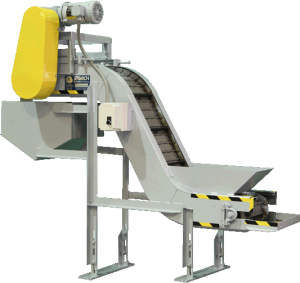 Medium to large parts, fasteners & scrap handling, and medium to heavy chip handling transfers, along with applications that create stringers and bird’s-nests require a more heavy-duty designed Storch 2-1/2″ pitch steel hinge belt conveyor with a 9″ tall frame.Hinge belt components manufactured from heavy gauge, durable steels. For over 60 years Storch Magnetics has engineered and built quality equipment in-house. We are certain that you’ll be happy with this addition to our material handling line.